Consultants at FMP work with a wide variety of clients across different fields; our work can sometimes see us running from office to office, or city to city. However, FMP found itself running somewhere entirely new five years ago: the basketball court! In 2014, FMP had the opportunity to partner with the University of Miami men’s basketball team for their 2014-2015 season. Our objectives seemed simple enough: over the course of the season, implement a system to improve both individual players’ performance, as well as how each player worked together as a team. 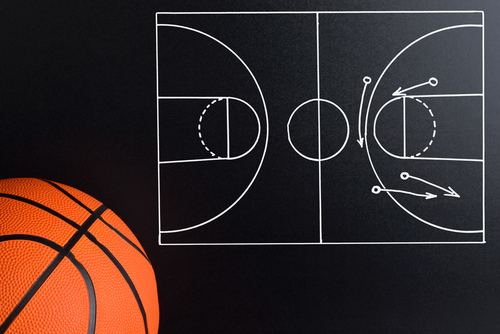 What remained, however, was exactly what system to use, and how to implement it- not exactly a straightforward question when your client is a college basketball team that wants to examine and shape individual and team performance for each game, as well as monitor the evolution of that performance over the course of the season! Enter the Productivity Measurement and Enhancement System, or ProMES (Pritchard, 1990; Pritchard, Harrell, DiazGranados, and Guzman, 2008)! ProMES is a performance management framework and system that has been implemented successfully in manufacturing, consulting, service, sales, and educational settings among different types of workers with various educational backgrounds. It works primarily through the identification and use of performance indicators, which are concrete, quantitative measures of behaviors that support a team member’s performance objectives. Indicators are totally tailored to each application of the ProMES system, meaning they can be vastly different depending on the client and context. Such indicators are established through in-depth discussions within organizations and teams about what behaviors A) most directly support the teams’ stated performance objectives; B) are able to be reliably and accurately measured; and C) are mostly (if not entirely) within each team member’s direct control. In this case, this took the form of FMP working closely with Miami’s coaching staff to define and codify the distinct on-court behaviors that would lead to greater team cohesion and, ultimately, more wins. Once FMP had arrived at a full set of indicators with the team, the mainstay of the work began: collecting data on these indicators after each game, and turning this data into actionable, impactful performance feedback for each player that they could take into the next game. What did this work look like, you ask? A lot of tool building, and a lot of basketball watching! A group of around 6-8 FMPers watched recordings of each Miami game almost immediately after they occurred, coding for the previously established indicators to note their prevalence, as well as who was performing them. Each game took anywhere from 2-5 hours to code, depending on the complexity of each coder’s indicators. Examples of these indicators included rebounding behaviors (those were my responsibility! ), such as having both hands up in the air when attempting to rebound, and moving to open areas of the paint when rebounding (versus multiple players crowding a single spot). Other indicators included offensive behaviors (e.g., passing the ball at least three times before attempting a shot), as well as behaviors in transition (e.g., hustling to ensure more Miami players were on the target half of the court). Our coders finished each game as quickly as possible in order to be able to turn such data into responsive feedback with as short a delay as possible. Their behavioral coding data was fed into Excel-based tools that consolidated all indicator observations and refined them into easy-to-use data dashboards for coaching staff. Additionally, FMP created individual player “scorecards” after each game, tailored to each player’s individual strength and challenge areas, that were shared with players and allowed them to focus their training efforts for the next game around those behavioral indicators least observed during the previous game. Throughout the course of FMP’s ProMES work with the Miami team, we were able to show trends of improvement throughout Miami’s 2015-2016 season on all of the relevant tracked behaviors. 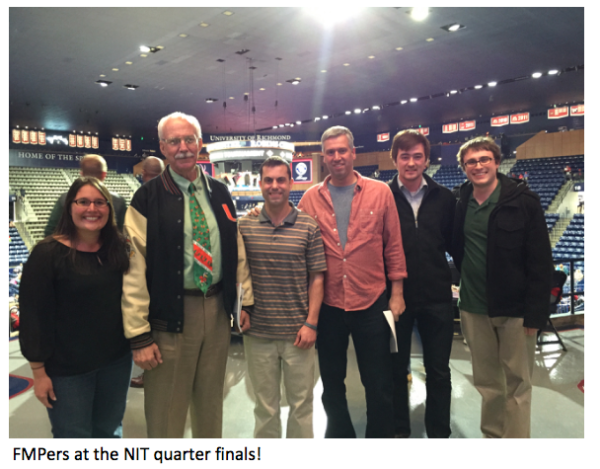 While the team unfortunately didn’t make it to the NCAA Tournament/March Madness, they still put on a great performance in the NIT tournament, culminating with the FMP team taking a trip to Richmond to watch Miami pull off a last-minute win in the NIT quarter finals! Unfortunately, Miami lost to Stanford in the Championship game, by two points, in Overtime, but their admirable performance in the tournament reflected their growth as individual players and as a team over the course of the season. This project was a great opportunity for FMP to apply its human capital and performance management expertise to a completely new organization and context… and to get away with watching hours upon hours of college basketball while at work. Go Miami Hurricanes! Pritchard, R. D., Harrell, M. M., DiazGranados, D., & Guzman, M. J. (2008). The productivity measurement and enhancement system: A meta-analysis. Journal of Applied Psychology, 93(3), 540-567.